You are here on this earth to do something wonderful with your life, to experience happiness and joy, wonderful relationships, excellent health, complete prosperity, and total fulfillment," write bestselling author and speaker Brian Tracy and his daughter Christina Tracy Stein. Most important, they say, all of that and more is within your grasp. Just like the lonely princess in the fairy tale who was reluctant to lock lips with a warty frog and transform him into a handsome prince, something stops many of us short of attaining our dreams. Our negative thoughts, emotions, and attitudes can threaten to keep us from achieving all that we're capable of. 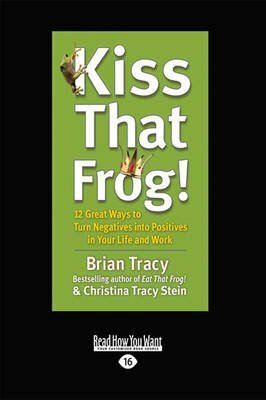 Here bestselling author and speaker Brian Tracy and his daughter, therapist Christina Tracy Stein, provide a set of practical, proven strategies anyone can use to turn those negative frogs into positive princes.Tracy and Stein present a step - by - step plan that addresses the root causes of negativity, helps you uncover blocks that have become mental obstacles, and shows how you can transform them into stepping - stones to achieve your fullest potential. The book distills, in an accessible and immediately useful form, what Tracy has presented in more than 5,000 talks and seminars with more than five million people in fifty - eight countries and what Stein has learned through thousands of hours of counseling people from all walks of life. "There is nothing either good or bad, but thinking makes it so," the authors quote Shakespeare. The many powerful techniques and exercises in this book will help you change your mind - set so that you discover something worthwhile in every person and experience, however difficult and challenging they might seem at first. You'll learn how to develop unshakable self - confidence, become your best self, and begin living an extraordinary life.